Wow – they've done it again! It seems like a new piece of Raspberry Pi hardware appears with every issue. 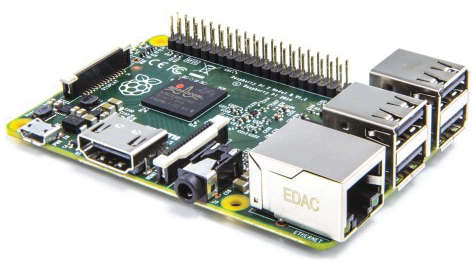 This time the Raspberry Pi Foundation has announced the Raspberry Pi 2 Model B. The Rasp Pi 2 comes with a more capable 900MHz quad-core ARM Cortex-A7 CPU and 1GB of SDRAM. Early reports are that it runs much faster than the old Model B. Rasp Pi 2 uses the ARMv7 processor, rather than the ARMv6 version employed with previous Pis, so you'll need an ARMv7-compatible OS to boot the system. The latest version of Raspbian, and the OpenELEC Pi2 option in the NOOBS setup menu are said to support Pi 2 systems. Other operating systems in development now that will run on the Pi 2? Ubuntu's Snappy Core and, most astonishingly: Windows 10! Raspberry Pi Turns 3 with 5 million sold! The Raspberry Pi was officially launched on the February 29, 2012, which means it has now reached its third birthday (or maybe its first birthday is next year, depending on how you deal with leap year birthdays). 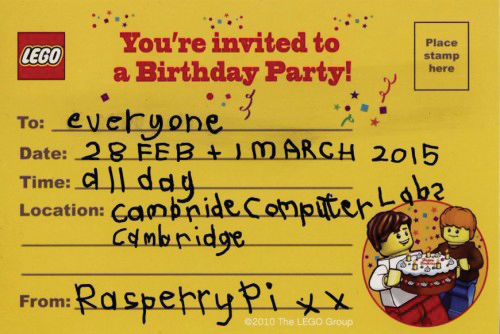 More than 400 people gathered in Cambridge on February 28 and March 1 at a celebration event organized by the Raspberry Pi Foundation  in partnership with Tim Richardson and Michael Horne (the guys behind CamJam ). The event resembled a standard Raspberry Jam, with talks, workshops, a show-and-tell area, and a marketplace. Those attending found a huge amount of swag, cake, and pizza and lots of beer provided by the Fuzzy Duck Brewery . The beer itself tasted of raspberries and was appropriately named "Irration Ale," which was presumedly a tip of the hat to Pi being what is known in mathematics as an irrational number. (The beer was brewed by the multitalented Ben Croston, who also developed and maintains the RPi.GPIO Python library). Even more impressive than the party is that, after three years, the Raspberry Pi and the community that surrounds it are still growing at an incredible pace. The Raspberry Pi Foundation recently announced the sale of Raspberry Pi number 5 million, including 500,000 sales of the new Rasp Pi 2 Model B in the last month alone. With these new figures, Raspberry Pi replaces the ZX Spectrum as the best-selling British computer in history. The next milestone will be to beat the Commodore 64, which holds the Guiness World Record for the highest selling single computer model of all time with total estimated sales ranging from 10 to 17 million devices.